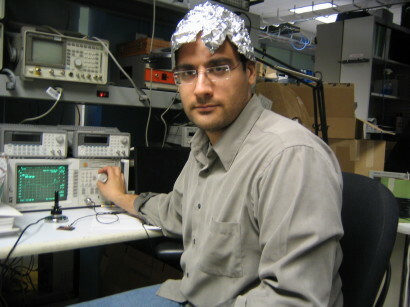 A hat made from tinfoil. With allusion to the belief that such a hat protects the wearer from mind control, surveillance, or similar types of threat. Frequently either extraterrestrials or the government are imagined to be the source of such threats. The earliest cited use of the term in the OED is from 1982, though the concept has been around much longer – since a 1927 science fiction story, according to the Wikipedia entry. Myself, I’ll stick to my tinfoil-lined duct tape wallet for the time-being. Aliens and men in black may be scary, but ID snafflers seem like a more real and present danger. How To Make A RFID Blocking Wallet.